The 22nd Annual Orange Beach Billfish Classic (OBBC), for the second year in a row, saw record participation and prize money. Fifty-three boats released twenty-five Blue Marlin, six White Marlin and one Sailfish while weighing five Blue Marlin. The OBBC annually is the first big game fishing tournament of the season along the Gulf Coast and is also the first leg of the Gulf Coast Triple Crown Championship. Done Deal, a 70' Viking from Houma, LA was the only boat to weigh a Blue Marlin on Friday night to claim the early tournament lead and would not be bested by anyone else in the fleet. 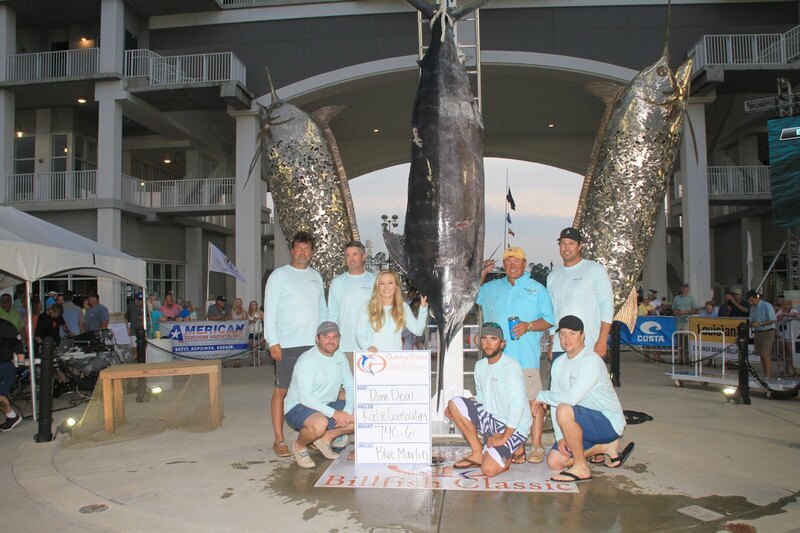 Angler Katie Gonsoulin's 118.5 inch Blue Marlin topped the scales at a shockingly big 740.6 pounds. "I was hoping that fish would maybe hit 700 pounds," said Done Deal Captain Jason Buck. "We knew it was a fat fish, but we are all happily surprised when the number posted!" That is the largest fish caught by the 21-year-old highly accomplished lady Angler Gonsoulin. As the weigh scales opened on Saturday night, four Marlin were headed to The Wharf Marina. The first was on Black Sheep, a 61' Garlington. Boat owner Rusty Skalla was on the rod for the 108-inch fish that weighed an impressive 513.4 pounds. The third Blue Marlin of the tournament belonged to Breathe Easy a 68' Viking from Orange Beach, Alabama that vaulted the team lead by owner Matt McDonald and Captain Pat Ivie into second place. The 111.5-inch fish caught by Rick Olsen would be the second largest fish of the tournament at 551.8 pounds. Two more Blue Marlin were weighed, but neither the 491.2 pound fish from the 72' Viking Born2Run or the 472.2 pound Blue Marlin caught on A Work of Art, a 92' Viking could bump Black Sheep from the third place spot on the tournament leaderboard. In the Catch and Release Division, Sea Mixer a 66' Spencer, added their name to the annual Johnny Johnson Memorial Trophy as they took home top honors with three Blue Marlin Releases, while Share-E, a 72' Viking also released three Blue Marlin finishing in second place. Team Supreme, a 76' Viking finished in third place. The Tuna category was won by Chasin' Tail with a 164.6 Yellowfin. Miss Mary was second at 158.8 pounds followed by Annie Girl at 157.6 pounds. A huge Wahoo brought big cheers from the crowd as the crew of Wynsong hung up a 110.4 fish that topped the nearest competitor by seventy-six pounds! Lyon's Pride was second in the Wahoo category at 34.4 pounds and Get Reel was third at 30.8 pounds. The Dolphin category was tight with only four-tenths of a pound separating first and second place. Geaux Time's 35.4 pound Mahi-Mahi edged out the 35.0 pound Dolphin from Breathe Reel Deep. Share-E added to their prize money with a third-place finish in the Dolphin category at 32 pounds. The Top Lady Angler was Sherry Polk on Share-E and the Top Junior Angler Award was presented to Jaselyn Berthelot on the Get Reel.